So I was going to write a post about collection development and how we decide what to add to the library collection, until I realized how uninspired I was to talk about it today. So I’ll talk about that another day. My personal life lately has been absolutely crazy, which is possibly why I was feeling a case of writers block. So bear with me as I try to free myself from my creative block. On Sunday I was driving around with two of my best friends from high school, its been over ten years since we have done anything like this, and we talked about books we read and how we remember the old card catalogs. One friend shared a story with me about some kids on her bus who were talking about something and she overhead one of them say “just Google it”. 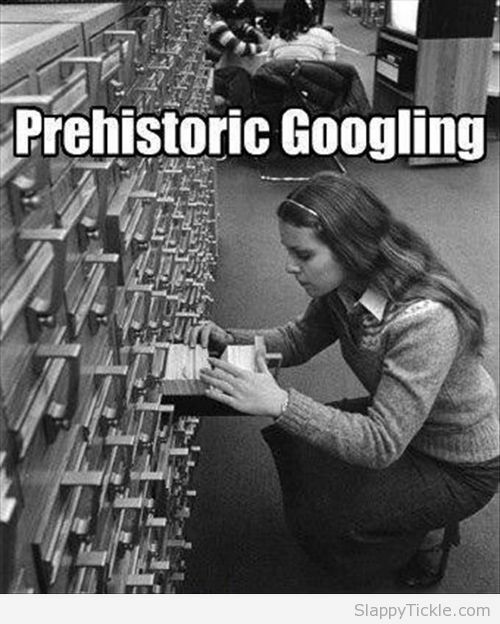 As I was listening to her tell the story and how she suggested to the kids they go to the library the next day to find a book to answer their question, it made me think of when we were children and our lack of Google and technology at our fingertips. I pondered this throughout the day as we drove around going from shop to shop, using our phones for GPS instead of a physical map. On our way to one store the GPS misdirected us and it struck me to go through my “passport” to see if there was anything for directions or landmarks to help us find our way. Thankfully there was and we were quickly able to locate the shop within a few minutes. To my amusement, across the street from the store was the local library. Throughout our drive we either saw signs for the local library or drove past the library which greatly amused me. All in all the day was a lot of fun and it was great to spend some time with friends who I do not get to see very often. Lets hope I can overcome my writer’s block soon. P.S. It might come as a shock to some people but librarians don’t actually live at the library. Try to let others down gently if you choose to share this surprising fact. This entry was posted in librarian, library and tagged best friends, bus, friends, Google, GPS, high school, libraries, shopping, technology by Katie. Bookmark the permalink.